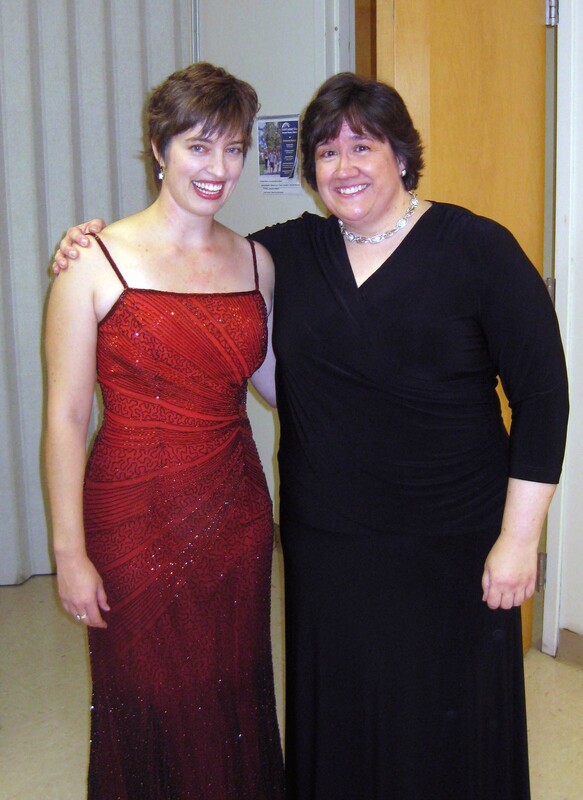 Violin soloist Lisa Vaupel and Elisa Koehler backstage. There’s something about the opening concert of the season that always puts me in a good mood, but this year it was extra special. As the Music Director of the Frederick Symphony Orchestra (FSO), there is always a lot of extra work the first two months of the season editing the season program booklet, coordinating logistics, and of course rehearsing the orchestra. So when it’s finally time for the first concert after all of that preparation, there’s a unique sense of pride and achievement in the crisp autumn air. This year it was a great kick to conduct the world premiere of Usonia by talented local composer Jonathan Cohen, Dvořák’s Symphony No. 7 in D Minor, and most especially to collaborate with my good friend Lisa Vaupel for Samuel Barber’s exquisite Violin Concerto, Op. 14. FSO also benefitted from a lot of good press and, as far as I could tell from the stage, we had a capacity crowd. The local paper, the Frederick News-Post, even published a story about me. Some people said that the article probably contributed to the turnout, but I think it was more likely that people wanted to hear our soloist, Lisa Vaupel, and the world premiere of Jonathan Cohen’s piece. Whatever the reason, it was a real thrill to perform for a packed house. Before the concert FSO Board President Matt Stegle and I were interviewed by Craig Shipp from Frederick.com, and Craig also filmed excerpts from the first half of the concert which he promptly posted online today, the day after the concert. Thanks to Craig’s generosity, the video clips are embedded below. Thanks, Craig! I subscribed to the AreaCable YouTube site and just discovered that they posted a new trailer for us (rather tongue in cheek, by the way). Enjoy!